Fou d'Absinthe is a popular perfume by L'Artisan Parfumeur for men and was released in 2006. The scent is spicy-green. It is still in production. A forum question prompted me to wear this again. Early in my perfumista days I visited a L'Artisan counter for a couple of hours and this was among the ones I bought (as well as Dzongkha, La Chasse aux Papillons and Timbuktu). It does have a slightly retro male vibe, but my nose fell in love. I still like it. Stimulating is one word I'd use to describe it, each note holding its own. Love the absinth, pine and cistus. To me it's a well-constructed soup, a darkly glorious feast for the nose. To me, this comes off as a stereotypical, searingly obnoxious men's aftershave. It's headache inducing and lacks any kind of humor or relief from its relentless character. I love the notes as listed on paper and some of the reviews sound wonderful, but it doesn't pan out for me. Up close, many of the notes are there--abisnthe, pine, anise, etc. But the sum of their parts doesn't add up as I'd hoped. They coalesce into such a conventional, predictable smelling masculine (from a bygone era of leisure suits and mustaches) it's hard to imagine this is what Giacobetti intended. Anyway, give it a shot because my experience seems to be in the minority, however, I can't see it any other way as much as I've tried. This is such a dark, intriguing fragrance! Based around the drink "absinthe", it has an unusual combination of notes such as artemisia, pine, fir, star anise, cloves and blackcurrant. It's such a deep green mix which is both fresh and aromatic at the same time. It opens up in a spicy way with nutmeg, black pepper and ginger, backed up by cloves, star anise... but the mid and base it what makes this one what it is, a deep, dark green mix of pine, fir, patchouli and bitter wormwood. It reminds me of old masculine classics with a very "green" vibe to them. Like being surrounded by forest and earthy roots. This one reminds me of the smell of a hot, dry pine forest, not a cold icy one. Maybe the type of pine trees near the Mediterranean or other warmer regions. It's like a dark, spicy drink... a green potion. I cannot testify as to whether absinthe tastes or smells like this does, but it's a very mysterious, intriguing mix of dark aromas that leaves me wanting more! Olivia Giacobetti is very talented to make this. I recommend it to try for something mysterious and altogether different. I should admit up front that I have a bias toward Olivia Giacobetti's work. I don't think of her as strictly a formalist by any means, but she uses technique as the springboard to surpass form. Her perfumes take you a certain distance into the recognizable, spin you around and then leave you to your own devices. e.g. Safran Troublant gives you a confectionery rose with a surprising hint of saffron. Just when you're at the point of reconciling these ideas, you're adrift. By the time you're in the heart notes you've left behind food and flower and find yourself accompanied by something else entirely, something you've never witnessed before. Similarly, by the time you make out the lily and the incense in Passage d'Enfer, they've given way to a third presence, again something completely new. Fou d'Absinthe takes an identifiable trope, the fougère, pays full respect to it, and then dispenses with it. The first sniffs of the perfume paint the picture of the fougère in full. Soapy, herbal, expansive. It has the broad strokes, large gestures and great strides of the classic aromatic fougères. It sits comfortably with Azzaro pour Homme, YSL Rive Gauche pour Homme and especially Paco Rabanne pour Homme. Into the heart notes, though, the form dissolves, though the perfume remains perfectly coherent. It seems appropriate that the genre that set the course for abstraction in perfumery gets taken apart, deconstructed. The ur-Fougère, Houbigant Fougère Royale, was a result of the thinking employed in other abstract arts: reduction of ideas to definitive characteristics, representation without depiction or narrative. Giacobetti again takes form, in this case the whopping fougère genre, tries it on for a bit and then moves on. I don't get a sense of irony in her method. It's more the joy of finding new beauty in well-worn form. Fou d'Absinthe also happens to smell spectacular. You don't need to scrutinize it. Like wearing an exceptional piece of jewelry, you can contemplate it or you can simply take pleasure in wearing it. The combination of simple beauty and depth of idea is characteristic of Giacobetti's work and is the outcome of her use of form as a means of inspiration and not an end goal. If you're ever confronted with the question of whether perfumery is art, try the side-door and look to the perfumer. Is there any doubt that Giacobetti is an artist? This fragrance opens icy and crystal-clear like a snow crystal on a bed of bitter green notes. As the head notes settle the icy aspect and the bitterness disappear; the fragrance gets drier and warmer because of the spices notes. I associate it now with a pine forest near a beach caressed by fragrant summer winds; this is not the same dark and resin-dripping pine forest of Fille. Unfortunately this pleasant fragrant accord does not last very long, after roughly one hour the fragrance changes again as it progresses towards the end. The pine accord weakens considerably until all I smell is a ”green” patchouli note. Mad for absinthe... and pine. As you can tell from my profile picture and wardrobe I’m very fond of coniferous, piney scents and aromatic fougeres. Of these, Fou d’Absinthe is as close as I’ve come to finding my holy grail fragrance. I always think of Olivia Giacobetti, the nose behind Fou d’Absinthe, as a master of juxtaposing “cool” and “warm” accords. Her classic creations Hiris, Philosykos, and en Passant are great examples. To create the illusion of cool in those fragrances she conjures an aura of atmospheric dewiness. But in Fou d’Absinthe Giacobetti uses a drier, aromatic blend of pine and balsam to create “cool”. It may not have quite the watery chill of her other fragrances but the airiness of the pine accords is obvious. On the other hand, Fou d’Absinthe gets its warmth from spice accords and patchouli. The namesake absinthe has notes that pick up both the pine and spice accords melding the extremes of cool and warm with an exotic, slightly medicinal/liquor aroma. Fou d’Absinthe appeals to me on so many levels. In its piney notes I find myself transported back to the forests of northern Minnesota and Wisconsin where I spent my childhood. I can imagine myself in a stand of pines on a cool, spring day wearing an old, comfortable sweater. The warm spice accord reminds me how the early season sun warms the sweater just enough to take the chill out of the air while resurrecting years of pleasant smells woven into its yarn. Finally, I’m one those people who choose fragrances according to season and the weather. I consider Fou d’Absinthe a three season perfume: fall, winter and spring. Here in the SE US the heat and humidity cause the warmer aspects of Fou d'Absinthe to bloom shifting its balance more to the patchouli, incense, absinthe end of the spectrum. The sparkling transparency that I find so appealing in cooler, drier weather ends up being a little lost. 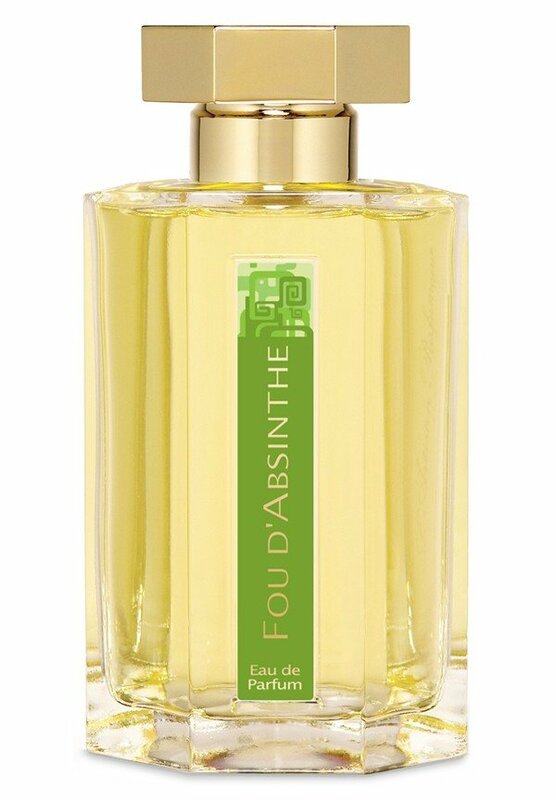 However, if you want a summer fragrance that leans to a light patchouli incense then you’ll probably love Fou d’Absinthe. Je Suis Folle du Fou d'Absinthe! L'Artisan Parfumeur FOU D'ABSINTHE is really a scrumptiously gorgeous oriental woody fragrance to my nose, and I have no idea why it is said to belong only to men. Fie! Could it be the inclusion of pine which led to this erroneous categorization? No, no, no, I must protest: the pine is far too light. This is not a bracing polo-playing male cologne at all. Far from it, in fact. This really is an oriental woody perfume--I swear. The fir, pine, and incense mingle together as woods, and the nutmeg, anise, clove, ginger and pepper form a seamless spice blend which lightly dusts the wood and other notes. Believe it or not, this composition is a second cousin to CHINATOWN and related Bond no 9 chypres (BRYANT PARK and LEXINGTON AVE). Partly the connection is the anise; partly the patchouli. I find FOU D'ABSINTHE to be an incredibly appealing blend--which I would love to add to my collection. Write the first Review for Fou d'Absinthe!